International Journal of Research in Health Sciences,2014,2,3,926-930. 1-Assistant Professor, Dept. of Community Medicine, Govt. Medical College, Ananthapuramu, Andhra Pradesh, INDIA. 2-Post Graduate in Anatomy, Govt. Medical College, Kurnool, Andhra Pradesh, INDIA. Background: Sexually transmitted diseases impose an enormous burden of morbidity and mortality in developing countries, both directly through their impact on reproductive health and indirectly by facilitating the sexual transmission of HIV infection. Objectives: To study the pattern of health care seeking behavior of women with sexually transmitted diseases in the reproductive age group (15 - 49 yrs), attending the STD out-patient department at Government General Hospital, Ananthapuramu district of AP state. Materials and Methods: This is a Cross Sectional study conducted for a period of two months from November to December 2013. 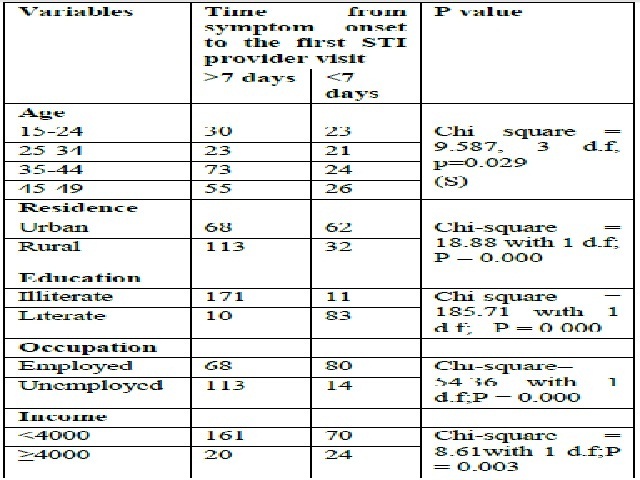 This study is conducted among the women in the age group of 15-49 years with symptoms of sexually transmitted disease attending the sexually transmitted diseases out-patient department of Government General Hospital, Ananthapuramu district of Andhra pradesh. Results: Convenient sampling of all women who attended the sexually transmitted diseases OPD during the study period is taken. A sample of 275 women was studied and the study was done in 3 phases. Conclusion: Awareness of the routes of transmission of STIs/HIV/AIDS is a crucial component of prevention of these diseases and hence the knowledge of modes of transmission and preventive methods need to be bridged by health education. The literacy, employment, total house hold income and residential area that is accessible to the health service provider are significant influential factors in early health seeking behaviour.